Tops & Blouses There are 20 products. 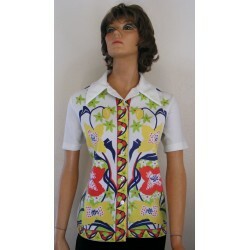 Women's white blouse or top with short sleeves. Made for Lerner Shops in the 1960's. 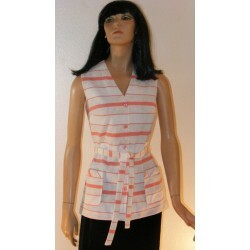 This blouse has figure flattering darts in the front and back. Buttons up the back. Nice classic style with a slightly unusual neckline. The white color really helps this top to mix and match with your wardrobe. 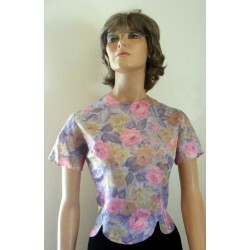 A nice, vintage top by Lerner Shops! Elegant and romantic, this top is set off by a row of velvet covered buttons with a sparkling white rhinestone. Beautiful against the black fabric and lace! Sweet, pretty, soft and silky are goods words to describe this shirt from the 1950s. Matching embroidery and trapunto on the front. Buttons up the back. Short sleeved with cuffs. Gentle gathering at the shoulders and darts for fullness and fit. What a fun, black ugly Christmas sweater! Made by Northern Isles. 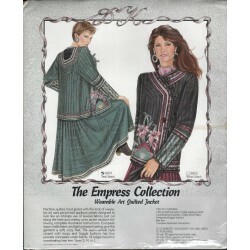 Several different Christmas trees appliqued on the front, back and long sleeves. Some of the trees are beaded, and some have sequins. Large size. This vintage, black Ugly Christmas is fun, but not over the top! Black, hematite colored beads which look like snowflakes or stars on black. Made by Ann Taylor, this is a stunning sweater. Great for special occasions -- just as great and fun for everyday! Big and bold - that is this great polyester top with pink, gray, and turquoise blue floral and geometric design on white background! Here is a very nice sweater, light and airy, to add a nice layer of warmth on a spring day or evening. Lots of stretch for a close fit too! 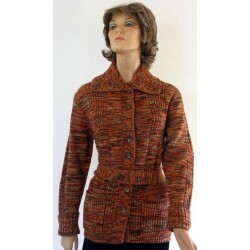 Fun and warm to wear, this multicolored, verigated orange and brown sweater from the 1970's. Comes with its' original belt, to help cinch in your waist and accent your figure. Lots of sparkle in this sweater from the 1980s! Metallic thread throughout and sequins surrounded by soft, fuzzy angora at the shoulders. Made by Eminent. Loose fitting medium size. This lovely V neck pullover will certainly help you stay warm while looking good! 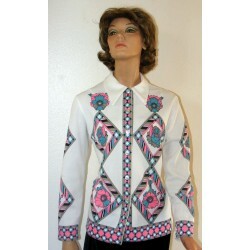 Vintage womens shirt from the 1970s or 1960s. Polyester fabric. Big, bold and color floral print on the front and back. Red, yellow and lime green. Short sleeves. Easy to clean and care for. Buttons up the front. Perfect for work, play or day time wear. 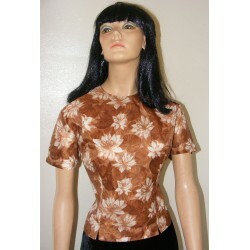 This vintage shirt would be a welcome addition to any womans wardrobe!